The unique Jenga like title has finally arrived, but will this new approach to "blox" pay off? Steven Spielberg? With a game? Boom Blox is very much like Jenga, but virtually...and better. This first try by Steven Spielberg to create a game works tremendously well, and its risky creativity pays off in strides. 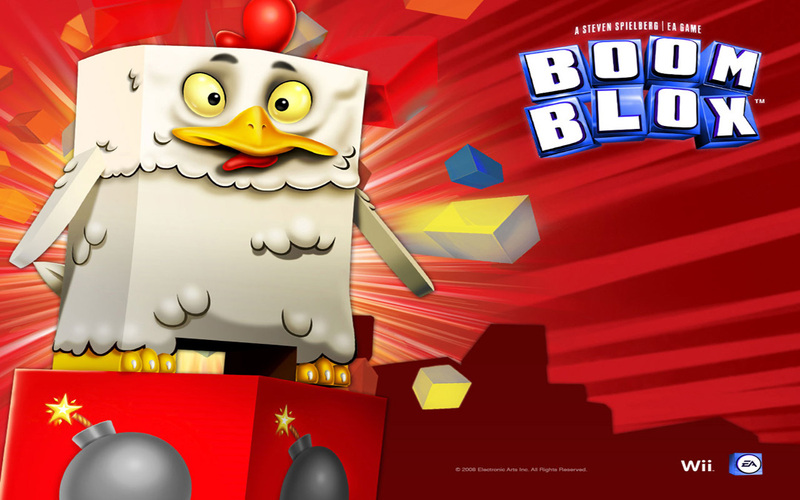 The main campaign of Boom Blox involves going from puzzle to puzzle using different means of removing the blocks in each scenario. The different means can vary from simply pulling a block out of a huge tower and hoping that the tower doesn't fall, to spraying the blocks with a hose, and even throwing a baseball at the tower. Usually, the game will easily recognize the pulling and spraying, but the game will have quite a bit of difficulty reading how much force you put on your throw. This will often result in the game throwing the ball in the wrong spot, or just you failing the mission. Volume: The best aspect of Boom Blox is the sheer amount of different, unique, enjoyable puzzles that seem to never end. There are upwards of 300+ different puzzles/missions to play through, and when you finish those, there is also a level creator to fill your time. In the level creator you will have the ability to build your own unique levels using a considerable amount of tools. Also, after you build a level, you can play that same level with your family or friends. Rent vs. Buy: Boom Blox is a highly enjoyable game, with a massive amount of different levels, and the level creator to keep you busy afterwards. Although the game is great, and the small quibbles such as the judgment of the game and the "suspect" camera are barely noticeable, this game isn't for everyone. If you are more prone to action games, then this might be good just for your family or the kids, but if you like a good family game that's also fun (unlike most family friendly games) then game away.